Ask any Sister and she will say that Raksha Bandhan is her favourite festival. Only a Sister can truly understand the importance of a Rakhi Thread. To make this day special for all the Brothers and their wonderful Sisters, we have got a beautiful collection of Rakhi Threads. Raksha Bandhan is the perfect festival when the Brothers and the Sisters get to strengthen their bond. 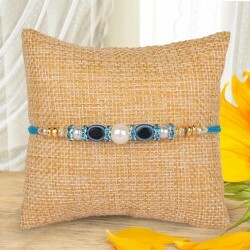 With the special Rakhi Threads, they get the opportunity to rejuvenate their relationship every year. On this day, the Sister ties a Rakhi on the wrist of the Brother and in exchange of that Rakhi, a Brother promises to protect her Sister from everything that might harm her. 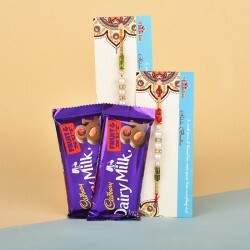 Not only can you buy and send Rakhi threads online with us, you can also send Rakhi with Sweets, Kids Rakhi Hampers, Mugs & Cushions, Silver Rakhi, Rakhi Gift Hamper, Kids Rakhi, Rakhi with Dryfruits, Rakhi with Chocolate, and so much more! 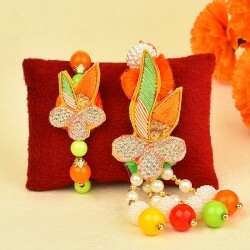 We offer online delivery of rakhi threads across India with Free Shipping. 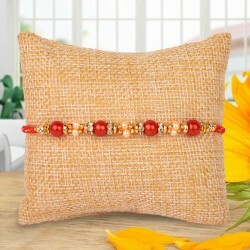 Also, we have a huge selection of rakhi threads ranging from the most simple rakhi threads to the designer ones. 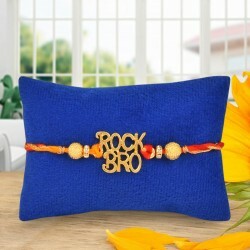 You can buy 2 or 3 rakhi threads online in a single purchase if you have more brothers to charm. From beautiful Rakhis with all-time favourite motifs like peacocks, elephant, Ganesha and Flowers, we have many other amazing Rakhis too. We have kids special Rakhis including Chota Bheem, Bal Ganesha and Doraemon. Other than these Rakhis, we have some special ones too. We have glorious Silver Rakhis, single rakhi, Kundan Rakhis and Rakhi Bracelets as well. These Rakhis are more than just threads. They are full of emotions and love for every Brother out there. 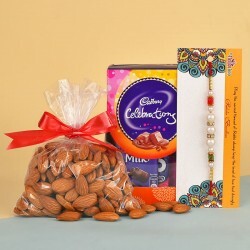 Send it with our Same day Rakhi delivery in India. 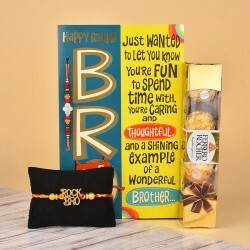 On this Raksha Bandhan, don't just send a Rakhi to your Brother but a special Raksha Bandhan gift too. This year send Rakhi with Flowers, Cakes. Our collection of Flowers includes Roses, carnations, Gerberas, Lilies, Orchids and Birds of Paradise. Our Cake collection has flavours like Black Forest, Chocolate, Strawberry, Pineapple, Mango, Chocolate Truffle, Ferrero Rocher, Coffee, Caramel, Coffee Caramel, Cheesecake, Kiwi, Fruits, Oreo and many more. 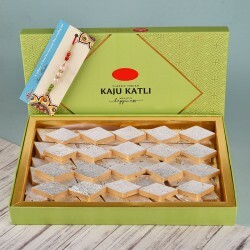 You can even Send Rakhi with Chocolates as well. 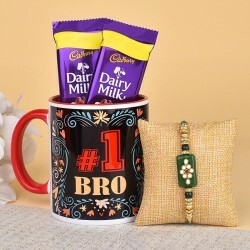 With special Mugs, Cushions, grooming products, stationery products, and other personalised and customised items, make this Raksha Bandhan memorable. You can also celebrate Rakhi with Dry Fruits and give your Brother a dose of healthy treats. We have pistachios, cashews, Almonds and Raisins. 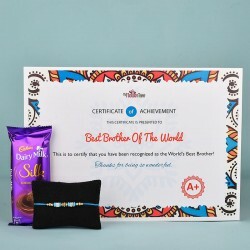 You can even send some Fruits along with Rakhi to your Brother and make him understand the importance of health to him. We have gifts for sisters too! Distance should not come in the way of any brother and sister who want to celebrate the beautiful festival of Raksha Bandhan. This is why we took it on ourselves to deliver Raksha Bandhan Rakhis and Rakhi Gifts to various areas. 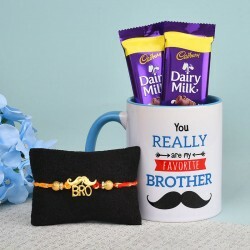 It does not matter whether your Brother lives in a metropolitan city, a remote city or in a foreign country; we will deliver your rakhi gifts to your brother in Delhi, Mumbai, Bangalore, Chennai, Assam, Puducherry, Rajasthan, Chandigarh, Canada, Dubai, Australia, USA, France, Germany, Africa. Our list is endless. 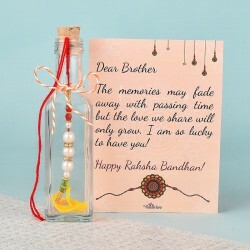 So, celebrate this special occasion with MyFlowerTree this year by sending Raksha Bandhan threads online. Products in this category have been rated 4.9 out of 5 based on 124 reviews.